Before any games I looked around and was very unpleasantly surprised about the number of Mace Windu squads. No one in Atlanta plays him and it was obvious that he would give my squad of 80 HP shooters major trouble. Those trepidations were verified in the first round against Les. In fact, Les built pretty much my ultimate nightmare squad, with Mace, GOWK, Doombot, Foul, Ferus Olin, and a Twi'lek bodyguard. How the heck was I supposed to kill anything? 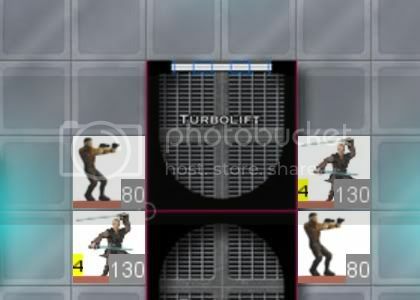 We played on Spynet (my map), and at the beginning of the third round we were loosely arranged around the elevators in gambit. I won initiative and proceeded to get off the greatest Jedi Mind Trick 3 in history. Ferus got activated. Foul got activated. Mace freaking Windu got activated! And even GOWK had to spend a Force point to avoid getting activated. Instead of doing the smart thing and shooting Mace, the deadliest member of the squad, I decided for some godforsaken reason to shoot at GOWK instead. And my guys shot well! Atton even rolled two crits, one of them on the OR senator shot! Next turn Mace killed Atton Rand like a punk and I did another zero damage to GOWK. Turn after that, Mace beat on Bastila while I did another zero damage to GOWK. On the sixth turn I finally broke through and PUT DAMAGE ON GOWK, except that Bastila was dead and Mace hadn't even been hit yet. In between all that getting killed and failing to wound GOWK I even managed to pull off a sweet turn where Carth finished off Ferus (whom Kavar had hit when he wasn't busy failing to hurt GOWK) and then killed Foul with the senator shot and a failed LS defense. But none of that helped much when Mace Windu came over and beat everyone to death a minute later. His killing arm must have been exhausted by the end of it, although probably not as tired as Kenobi's shot-deflecting arm. Second round I got the bye, which was probably a good thing. My poor choice of strategy combined with Les' invincible saves had not gotten me in the right frame of mind. The crucial difference is that I had already used ABM, while Jason had chosen not to. I won initiative and made him go first, reasoning that his Carth could not kill my Carth, and that he would either have to run Carth away and let me go nuts on Kavar, or activate Bastila and use ABM himself. Afterwards Jason said that he should have used Mind Trick 3, which could have been extremely unpleasant, but at the time he used surprise move to run Carth away and went ahead and popped ABM. Carth didn't make it far enough, and I used a Force point to chase him down and blow him away with my Carth. Just to keep things tidy, I also attacked his Kavar with mine, hitting both shots and very luckily getting both of them past LS defense. At that point Jason commented that he had lost the game right then, and I pretty much agreed, especially after I only took 30 damage back from his Kavar. But then I committed a ridiculous blunder that let him snipe my Atton with his (yes, I'm not making any of this up), which pretty much instantly flopped the game from "easy win" to "anything could happen". After screwing that up I played very carefully, putting lots of scrubs between Atton and Kavar and playing super-cagey with Carth. Our Kavars whaled on each other for a while, we eventually ran out of Force points and threw our Bastilas into the fray, and at the end I managed to kill his Kavar and Atton without losing any of my important pieces. The game ended up being very close, and largely hinged on me making LS defense saves against Bastila. Jason clawed back from a serious deficit and made it a nerve-wracking game. Fourth round I played against David Stoecker, who had pretty much every Republic Commando there was. It was an interesting matchup because he had practically as many SAs as CEs, so Bastila was not nearly as useful as I would have thought. Rex and Doombot was also always a threat with my low HP shooters. We played on his map, Ren'Var. 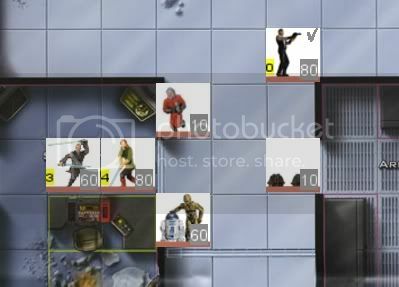 In the third round I used ABM, ran Kavar into the main room, and fired Jedi Mind Trick past some rodian diplomats to hit half-a-dozen of his commandos and troopers. He failed either every save or all of them but one, and suddenly I had a huge hand up. Unfortunately I did not track squares very well and he managed to do exactly what I was afraid of - tow Rex and shoot my dudes. Except instead of my shooters, he got Bastila! Despite Kavar buffing her defense, he hit everything, and suddenly my ABM was gone and Bastila was almost dead and I had to waste Atton and my OR senator on killing Rex. Well, at least I killed Rex. Fortunately David couldn't build on that success because so much of his squad was activated or out of position to attack Kavar, and even with his CEs he needed high numbers to hit Kavar's beastly 28 defense. With Rex gone I had a little bit more freedom to push my shooters forward, and we basically had a huge melee in the center room where my guys had higher attack, defense, and damage. It was messy, but still a win. 1. Is one of the best players in the world. 2. Had a squad with disruption, a beatstick who almost never dies to shooting (you just heal him! ), and a huge activation edge with Dash Rendar as a huge late-round threat. 3. Had already lost to my squad four times in playtesting and was tired of it. We ended up on his map, and after ridiculous metagaming he took the outside as well. The first round nothing much happened. During the second he ran his stupid chadra-fan pilot into my squad (arranged around the gambit turbolift), where I got to watch Carth fail a pheromones save, then had to reroll the stupid thing twice with Kavar. Not an auspicious start to the game! Fortunately Daniel wasn't being super-aggressive with Dash, and settled for running him into the security station to set up vicious enfilading fire the next turn. I wasn't having any of that, so at the beginning of the next turn I popped ABM, ran Carth in, and used the senator shot to blow Dash away. Daniel countered by running Corran and Artoopio up, but he could only hit Carth for 30 damage because Bastila took away his GMA. I ran my man Kavar in to base Corran (eating the AOO), then executed a slick combo where I locked the back door shut (isolating Corran from Artoopio), which let Atton shoot at Corran with the much-needed +3 to attack. Daniel didn't want to waste Force points absorbing when he hadn't taken any damage yet, so Atton put a vital 40 damage on him! 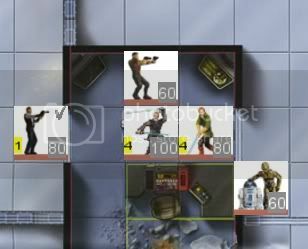 I had to use Atton's last Force point to do it, but I found a tricky LOS to my arch-nemesis, Artoopio. I had literally never won a single game against those metal heroes. And there was my chance to destroy them! Atton responded to my bloodlust by hitting both of his shots, giving me Kavar's mojo back and brightening the outlook considerably. Then Kavar joined in on the fun by throwing Corran a crit of his own. Now things were getting close! Daniel based Atton with an ugnaught to take away my senator shot and put 30 damage on him with the TBSV, while I used a Force point to run Bastila into the security station and base Corran, who promptly critted her on his Jedi Reflexes AOO. Oof. Next turn Daniel won initiative again, and proceeded to lay into Kavar. Everything hit and Kavar was dead unless I made a save. First roll failed. After some consideration, Daniel decided to keep his Force points for absorbing shots instead of cancelling my reroll. I agree with the decision, but I passed the save and Kavar stuck around. He even managed to hit Corran another two times (needing pretty high), setting up Bastila for the finisher. And that was pretty much the game. His backup shooters were no match for Atton, especially with Kavar's CE. His TBSV missed a bunch of shots while Atton ran around executing people. We both said immediately afterward that it was probably the best game we have ever played, and I still agree after thinking about it for a few days. It was incredibly back-and-forth, and the matching criticals swung the mood of the game so far one way and then the other that it was ridiculous. The only really bad move either of us made was my botched surprise move escape, and I like to think that I redeemed myself with the maneuver to shoot down Artoopio. After that the final round was a little bit of an anticlimax. At the end of the second round Bronson leaped Vader into the heart of my phalanx and blew Carth away. Then after autowinning initiative, he blew Atton away. Except... Atton made his first avoid defeat save. And made the second with a reroll! 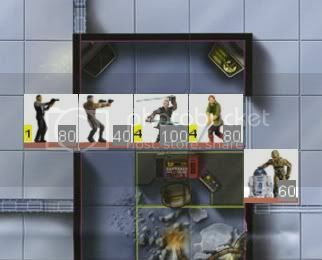 Bronson had assaulted, so he had one last attack to kill Atton again, except his missed, thanks to Kavar's boost. I immediately cast ABM and shot Vader down. Bronson actually made a really nifty move with Pellaeon to put Vader inside the ysalamiri bubble, which led to Kavar missing one attack and not getting ABM on the one that hit. Fortunately Atton's head was on right, and he landed the senator shot to finish the Dark Lord off. Bronson very magnanimously resigned after that. I think he could have still made it a game, but he wasn't really interested in spending another 50 minutes trying to eke out a win. Full HP Kavar would have made it difficult, in any case. As he said in his writeup, if he had swapped Vader out instead of going after Atton, it would have been extremely difficult for me to win the game, if I could have at all. He just got a little bit too greedy and I lucked out with Mr. Rand's avoid defeat save. No doubt he will reap his revenge later this season! I had a grand time at Owensboro and enjoyed all of my games, even the one where my squad basically just bled on Mace Windu while cussing at GOWK. It was great seeing everyone and I am looking forward to the rest of a very promising regional season! EDIT: Note that I botched the numbers in my little graphics - Corran should have 100 HP and Carth should go from 50 to 30 to dead. Last edited by greentime on Mon Apr 16, 2012 6:20 pm, edited 1 time in total. First class recap. Aces!! I think it is interesting to note that this is the first regional to be won by a squad made up almost entirely of Vset pieces, with the exception of the mandatory tech that would be found in any squad. OR wins, with a duplicate squad in the tourney and no Yobuck and no Rebel squad even see the field. Mission accomplished Vset team? I'm lucky to be able to remember the top 5, lol. I knew the top 4 and the order they were based on how they were paired in the finals, and Aaron is a local who only missed the top 4 because his final game in Swiss went to time. If he had a 3 point win he probably would have had a seat at the finals.